In the second half of 2018, Austria assumed the Presidency of the European Union’s Council of Ministers. 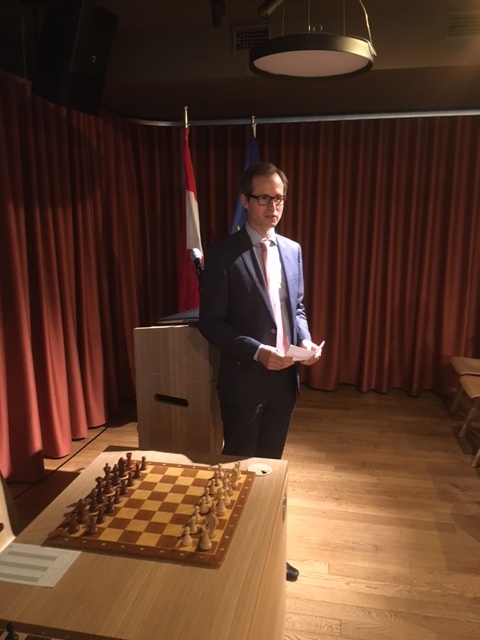 In line with established custom, Europchess invited the best player of the Presidency country to give an exhibition in Brussels in cooperation with the Austrian Permanent Representation. We were very glad that GM Markus Ragger flew in from Graz. The head of the legal department, Dr. Philipp Bittner gave a warm welcome on behalf of the Austrian Representation to the EU, followed by some words of Europchess President Frank Hoffmeister. Markus Ragger was born 30 year ago and grew up in a small village near Klagenfurt. He learned chess from this grand-parents by watching the game at very early stage (a bit like Capablanca…). His talent was soon discovered at local level and he became Austrian U10 champion – at the age of 8! Countless Austrian trophies followed, and he rose to the rank of Grandmaster when he only turned 20 years old. Markus received training from GMs Zoltan Ribli and Artur Jussupow and has established himself among the top 100 of the world. He is probably the biggest Austrian talent after the father of the Vienna school, Carl Schlechter (who died in 1918). As the first Austrian to have ever crossed the 2700 ELO bar, he heads the Austrian national team and plays in several first leagues in Europe. For his visit to Europchess, Ragger gave a lecture about his game against the French GM Sébastien Mazé from the Olympiad 2016 (http://www.chessgames.com/perl/chessgame?gid=1833419). In a topical King’s Indian he chose a line which he had played before with White against GM Hikaru Nakamura. Ragger told the audience that Nakamura “just played his analysis and did not think a minute” to get to a draw. He was a bit annoyed with the fact that Black could equalize so easily and tried to find an improvement. And indeed, during travelling he found the new idea to play 26. h4! After this move, White seized the initiative on both wings and crowned his play with a beautiful combination: after eliminating the heavy pieces the foot-soldier marched unhindered to h8, queening and taking the full point! 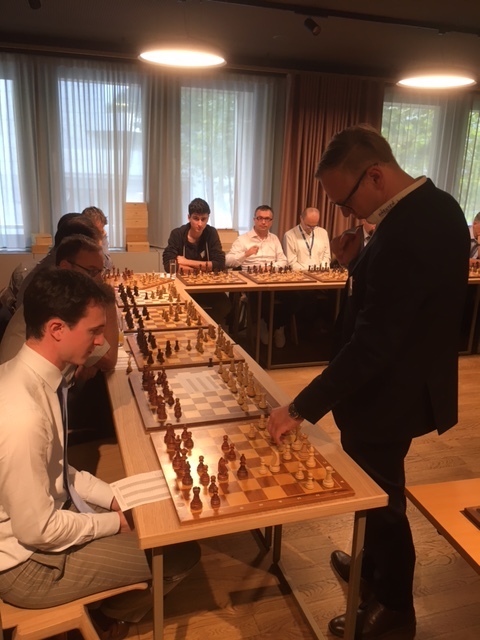 Ragger’s insightful commentary was easy to follow and Europchess members enjoyed discussing alternative moves with him on the spot in a collegial spirit. 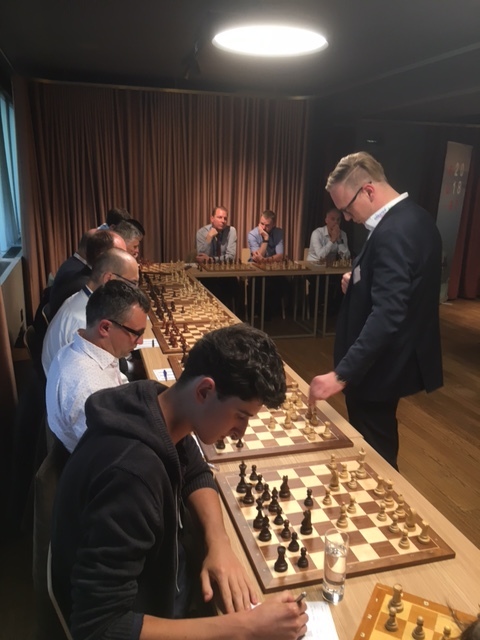 After this inspiring lesson, the grandmaster faced 20 club members and 2 members of the Austrian Representation in a simultaneous exhibition. He opened with a variety of openings using 1.e4, 1.d4 and 1.Nf3 and had to deal with strong opposition. While scoring against most of his opponents with convincing play, he had to concede draws against Milan Beles (Slovakia), Tim Binham (Finland), Georgi Tomov (Bulgaria), Kristian Frederiksen (Denmark) and Eduardo Semanat Planas (Cuba). Moreover, Johannes Bertram (Germany) won after a tactical oversight and our youngster Carlo Russian (Italy) had the guts to convert a rook ending with a pawn up into a full point! The result was thus a clear 17.5-4.5. 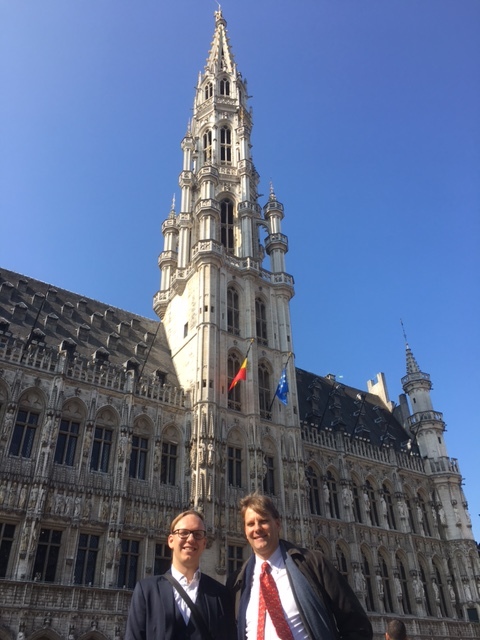 Besides, Markus Ragger also got to know some bright sites of Brussels: we showed him the Grand Place and parts of the old town and could invite him to a nice Greek restaurant after the hard work. 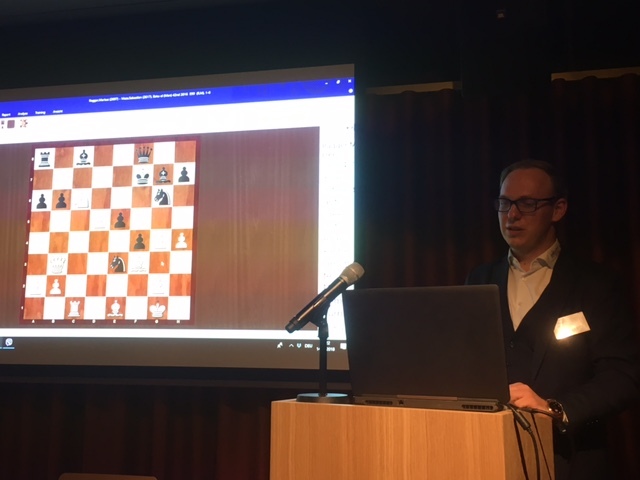 During the dinner Markus gave some valuable insights into the preparation and training methods of a professional world class chess player prior to an important tournament. These will be helpful for the upcoming chess Olympics in Batumi for which we wish him best of luck. Finally, we would like to thank the Austrian Presidency and him for a spectacular chess event in best European tradition!